This election season has seen the issue of religion surface again and again. The Romney campaign has labeled President Obama as an attacker of religion. Romney’s own faith has been a subject of debate as well. But this is not a new development. Religion has played a role in presidential campaigns for over 150 years. John C. Fremont’s possible Catholicism was questioned in 1856 by Democrats: if he was elected, would the Pope rule the U.S.? Al Smith suffered similar attacks in 1928. Neither candidate was elected; their links to the Catholic Church were part of the reason for this. The trend in America politics seems to have been (and may still be) one of fear of and discomfort with the religiously unfamiliar. The Living Room Candidate can help teachers provide students with a more-recent look at this trend. 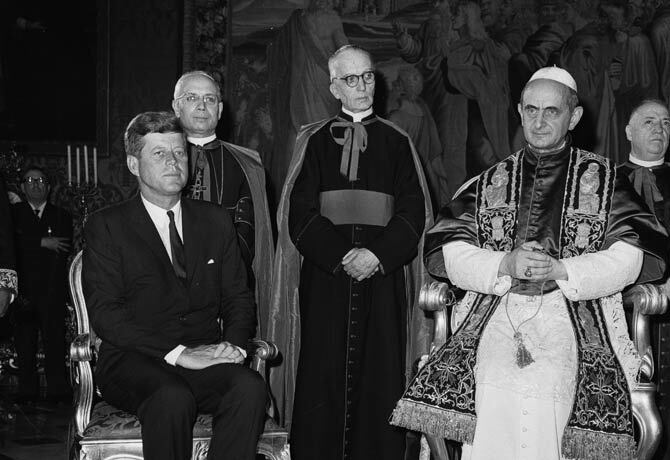 Kennedy’s Catholicism was also scrutinized in 1960. For teachers interested in this topic, and for teachers interested in the history of presidential campaign television commercials, this website provides a poignant video. This video depicts Kennedy defending his ability to lead the nation as a Catholic while honoring the doctrine of separation of church and state. Allaying the deeply-embedded (and absurd) fears of Protestant America that the Pope would sail up the Potomac as a crowned monarch upon his election was one of the many reasons why Kennedy won in 1960. This made him the first Catholic president in United States’ history. What is a social studies teacher to do with television being dominated by presidential campaign advertisements? It is very tempting to be cynical and decry the commercialization of politics in our culture. An alternative pedagogical route would be to provide the historical background of presidential commercials. Are these claims true? One website that may help a teacher answer this question and provide historical insight to presidential commercials for students. The Living Room Candidate is a treasure trove of many of the most influential presidential campaign advertisements from the television age. By going to their 1952 campaign site, a teacher can get students to critically evaluate the claims of American Pageant. Were Ike’s commercials “tightly scripted“? Were Ike’s commercials “devoid of substance“? Did they “oversimplify complicated economic issues“? Of course, teachers should not overlook the Adlai Stevenson campaign either. Why would your students make of these ads? The 2012 presidential debates are approaching. Many social studies teachers may incorporate the Obama-Romney debates into their classroom. The Miller Center is an excellent resource for teachers who would like to provide opportunities for students to compare/contrast this election with past ones. But getting past the surface takes a little more research. If a teacher was interested in pursuing the similarities and differences, on a deeper level, between the 1980 and the 2012 elections, the Miller Center’s site on the Campaigns and Elections of Jimmy Carter would be very helpful. Teachers will find both the 1976 and 1980 elections summarized here. Additionally, videos are posted that include clips of the presidential debates from each election. Hopefully, these resources can help teachers find ways to make past elections and debates relevant to the current election and debates. President Truman’s March 1947 address to a joint session of Congress outlines a new approach to US foreign policy, which would become known as the Truman Doctrine. By pledging US economic and military assistance to nations resisting communism, either by internal insurrection or by foreign influence, Truman’s speech is the first major commitment of the United States to a policy of containment. Both the text and an recording of Truman’s address are available from the Miller Center at the University of Virginia. With election season in high gear, many social studies teachers may be looking for ways to incorporate the campaigns into their classrooms. The University of Virginia’s Miller Center is an highly informative, nonpartisan resource that is very useful for analyzing presidential history. There are a couple links within this blog that are especially relevant and interesting. One site is called: “Greatest Hits from Democratic Conventions Since the Progressive Era.” A useful companion for teachers wishing to engage in compare/contrast activities would be: Greatest Hits in the Modern History of Republican Conventions. The National Endowment for the Humanities’ EDSITEment project presents a series of Constitution Day resources and lesson plans for K-12 classrooms. At their Constitution Day page, find links to a variety of lessons organized by grade bands. No matter what grade you teach, plans and resources appropriate to your students are available. Many APUSH classes are beginning their study of the reasons that Colonial America sought separation from Great Britain. One of the many significant undercurrents of this era was the First Great Awakening. TAH has a fabulous curriculum unit that, through the use of primary documents, introduce students to the First Great Awakening, as well as to the ways in which religious-based arguments were used both in support of and against the American Revolution. These lessons can be found here. On this day in 1957, Arkansas Governor Orval Faubus, in defiance of a federal court decision ordering compliance with the 1954 Brown v. Board of Education ruling, called out the Arkansas National Guard to obstruct the integration of Little Rock Central High School. The incident marks the first major test of the decision as well as the Eisenhower administration’s will to enforce the order. The United States National Park Service’s We Shall Overcome: Historic Places of the Civil Rights Movement website chronicles Little Rock Central as well as dozens of other civil rights-related historic sites listed on the National Register of Historic Places.